E-stop switch disassembled. The switch is a NC momentary & the button contains the latching mechanism. 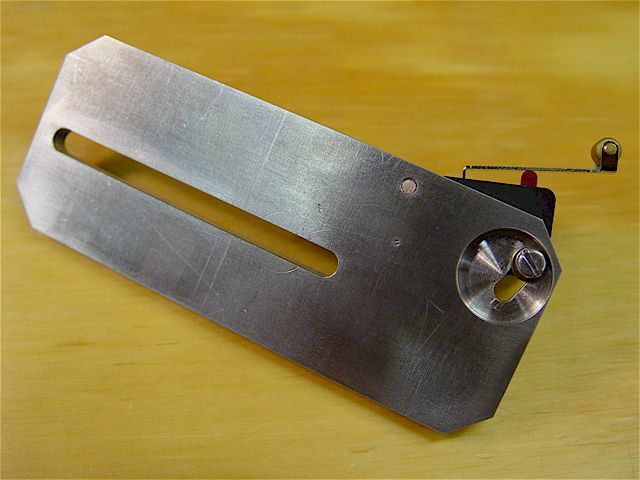 It attaches through a 7/8" mounting-plate hole where the button bayonets into its base to hold the switch. Left-side E-stop shown. Also, note the two leveling shims under the mill's feet. LPT1 pin 13 input of the breakout board. A pressed E-stop causes the breakout board to pull all LPT1 outputs to ground. 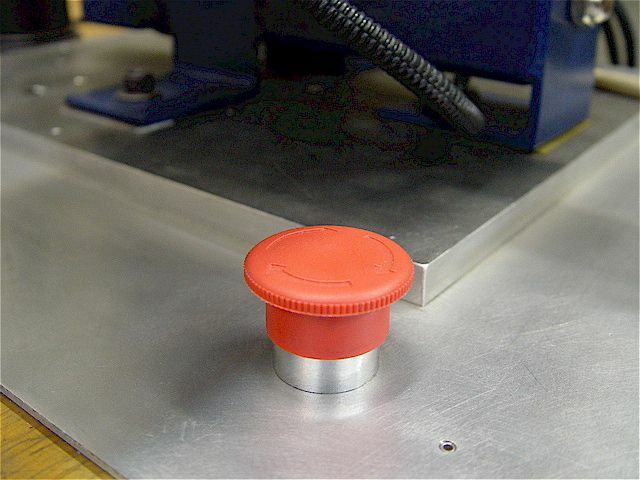 Mach3 E-stop input setup. 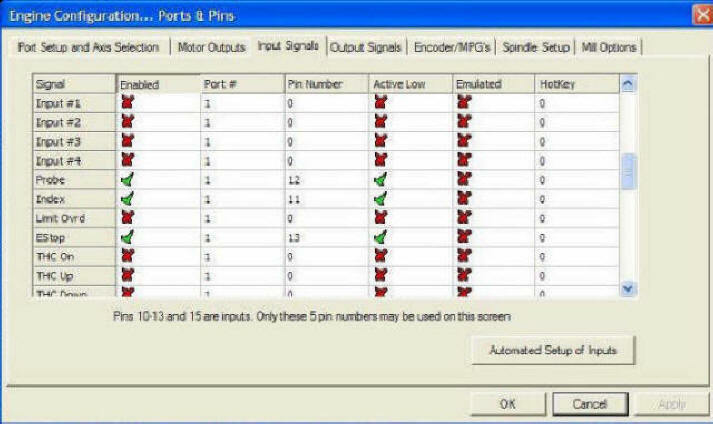 LPT1 INPUTS are 10, 11, 12, 13, 15 & LPT1 OUTPUTS are 1-9, 14, 16, 17. 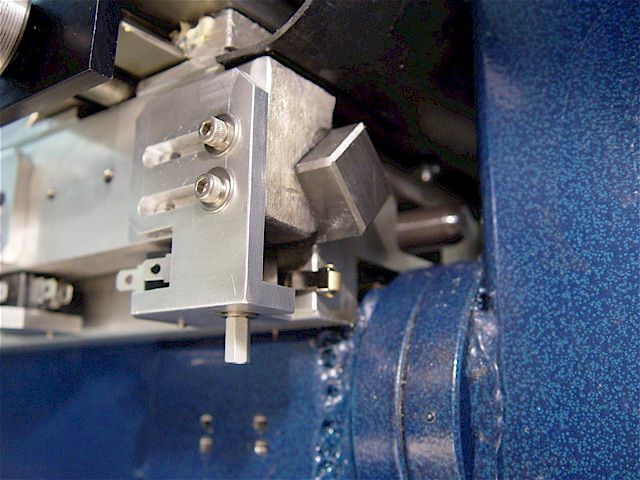 Also see an E-stop for the Jet BD-920N lathe spindle. 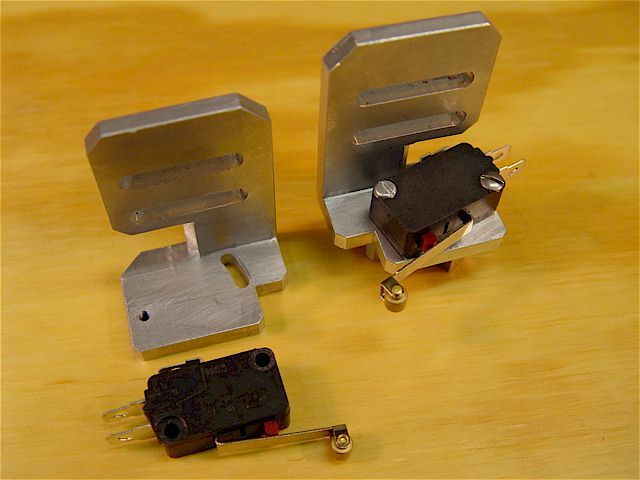 One-piece, mirror image, +/-Y-axis limit switch L-brackets. 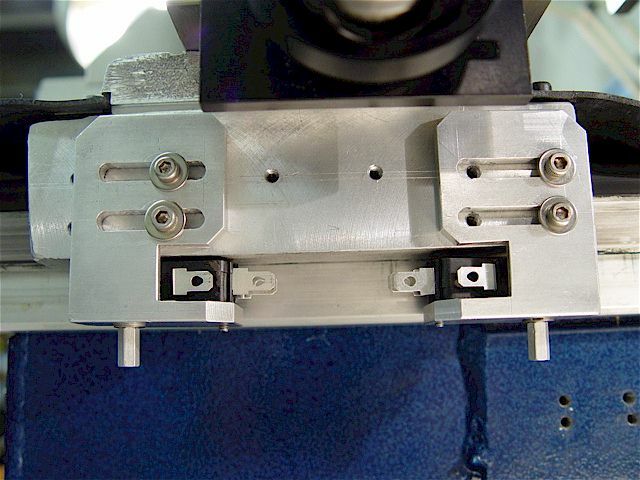 The slots & pivoting mechanism allow position adjustments. Two, 4-40 screws hold each switch. 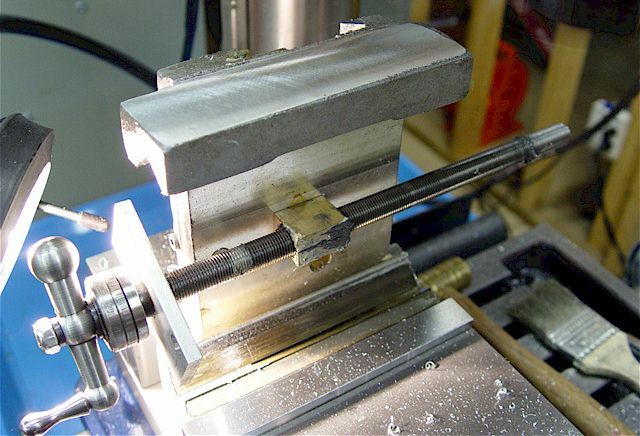 The plate is threaded for the pivot screw. Switch holes are #5 counter bored. 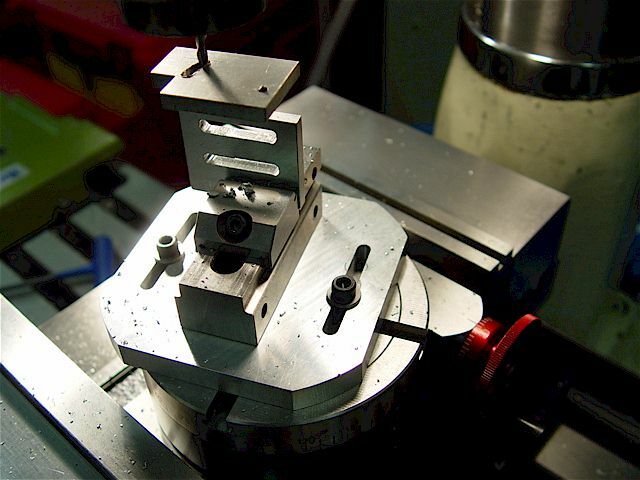 Used the small rotary table to mill the short arched slot for the pivoting-switch adjustment. The right side of the Taig's cast aluminum carriage was fly cut, flat. 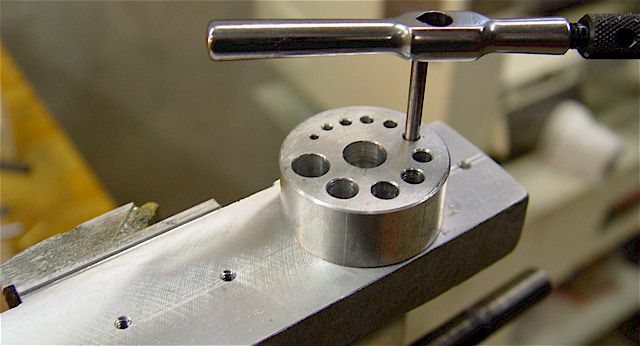 Holes were tapped with 6-32 threads. 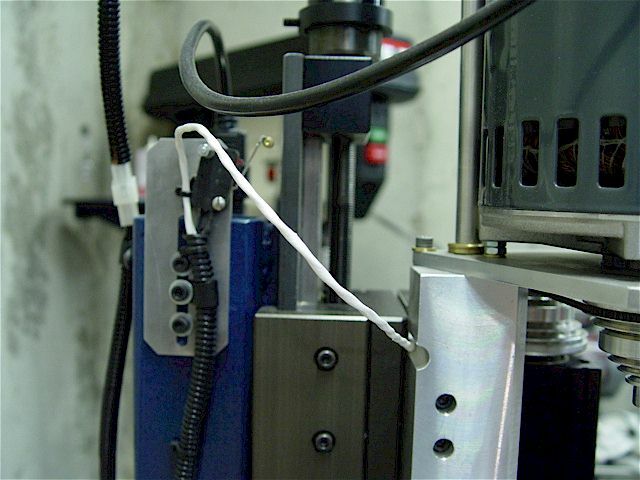 +/-Y-axis limit switch brackets shown temporarily mounted on the milled & tapped side of the Taig carriage. SS, 6-32 cap-head screws & washers hold the brackets. The +X switch will be located in the middle area. 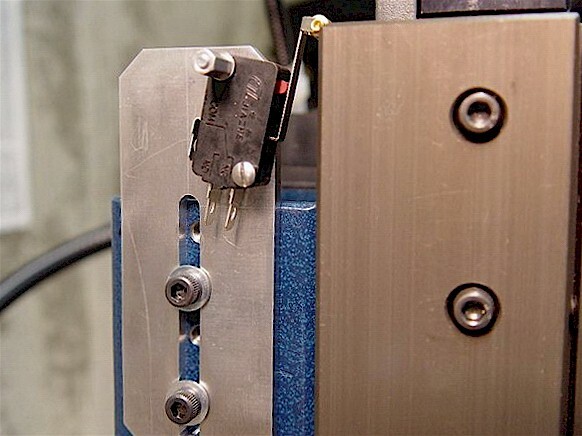 Front, +Y-axis limit switch shown tripped. 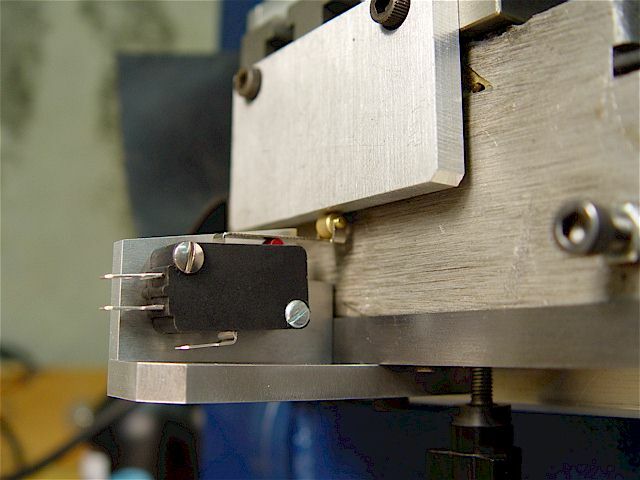 The extended hex nut (a stand-off) acts as a knob when making the adjustments. 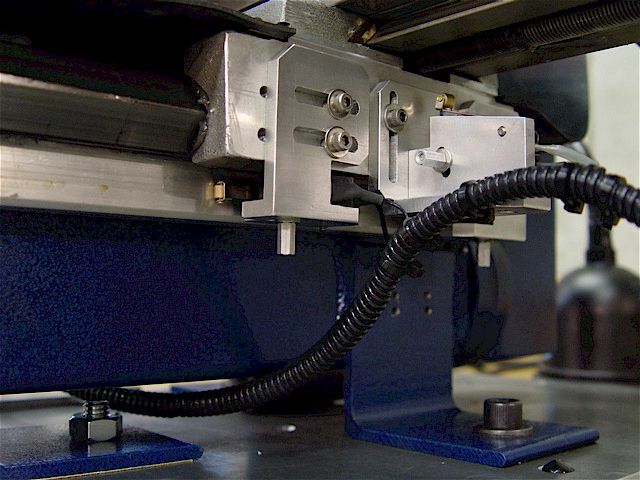 The notch by the roller eliminates any possible bracket interference & allows small swarf to drop through. The switches ride along the smooth, extruded lower area surface of the Taig's carriage & trip open at the front or back edges. 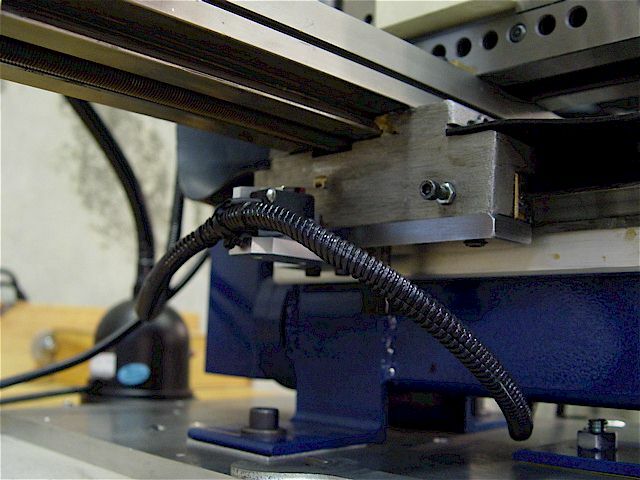 The bracket protects the switches that are tucked-up underneath the table to reduce the effects of swarf. I considered a knurled thumb nut but decided it was best to be able to lightly (3/16") wrench tighten to hold the settings better. 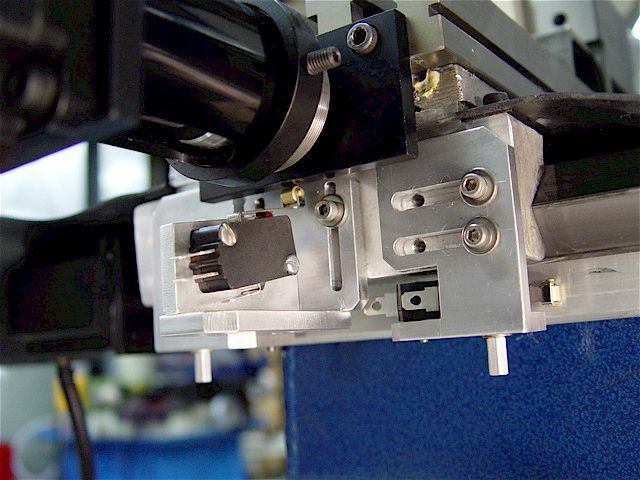 The X-axis switch rollers are released for normal operation & depressed at the +/- limits. 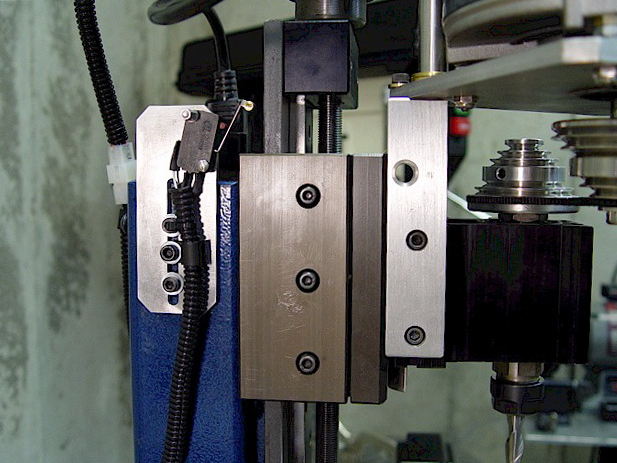 The Y-axis switch rollers are depressed for normal operation & released at the +/- limits. The Z-axis switch roller is released for normal operation & depressed at the upper limit. All switches, wired in series, are closed during normal operation & opened at the limits. 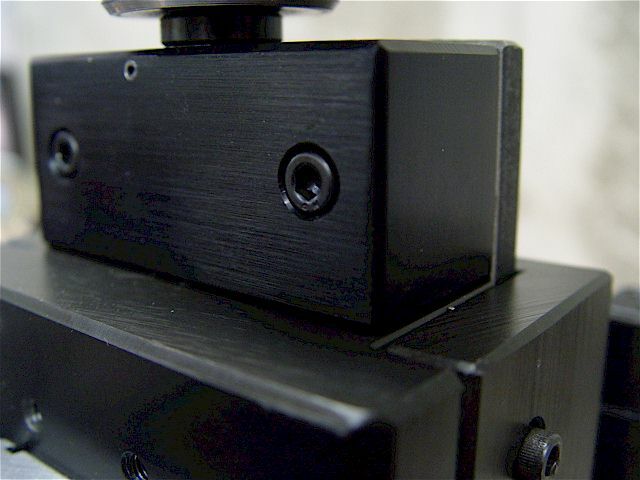 Rear, minus Y-axis limit switch shown tripped. 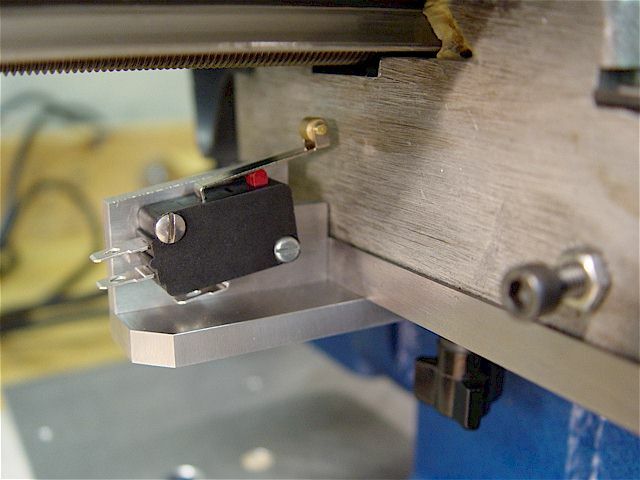 Milling the +X-axis limit switch adjustment plate. 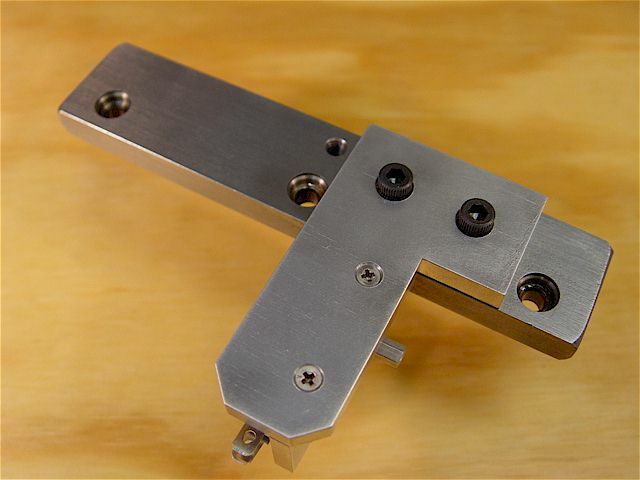 +X-axis limit switch adjustable bracket. 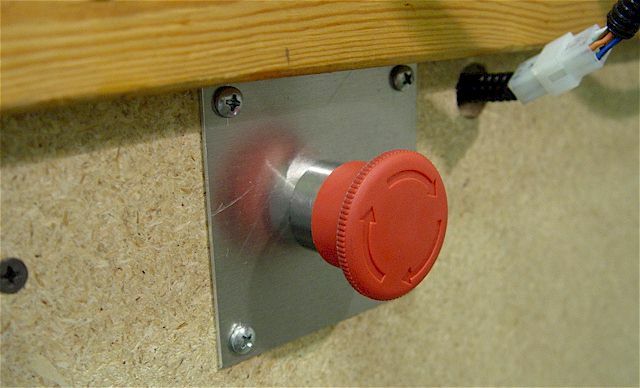 The switch roller-lever is characteristically loose & can move from side-to-side. 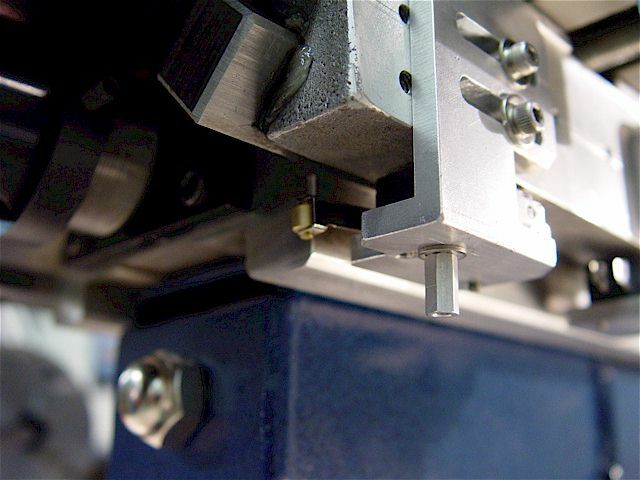 The notch by the roller eliminates any possible interference. 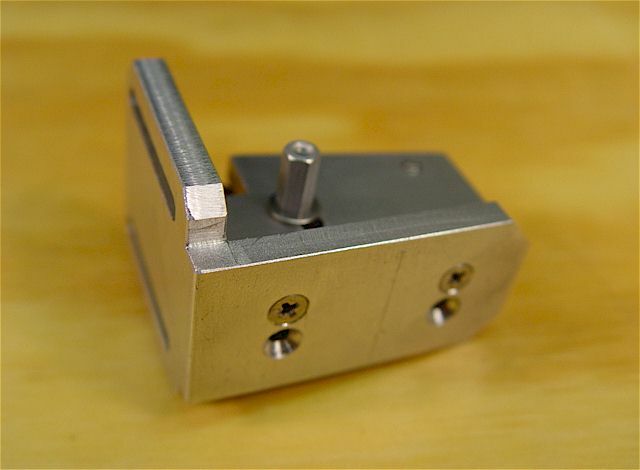 The switch plate is held by two, 4-40 countersink flat-head screws on the bottom of the bracket. I changed sides to locate the switch more central to the table to lower swarf effects. The table lead screw bearing plate trips (depresses) the +X limit switch. 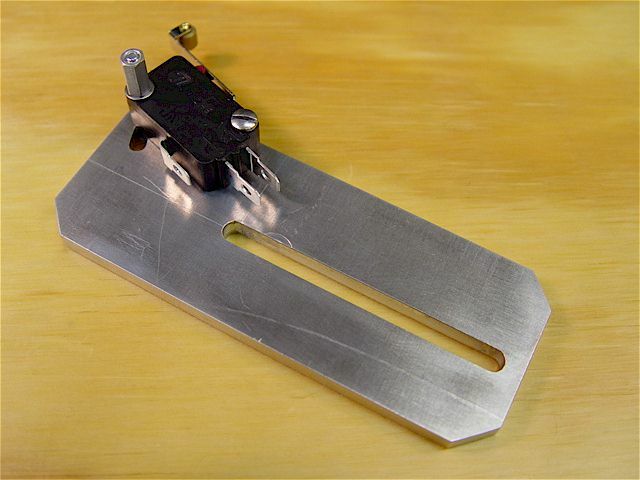 Minus X-axis limit-switch bracket bolted to the bottom of the carriage gib retaining plate. The steel retaining plate was drilled & tapped for two, 10-32 screws. The switch adjustment plate is, as all others, held by two, 4-40 screws. 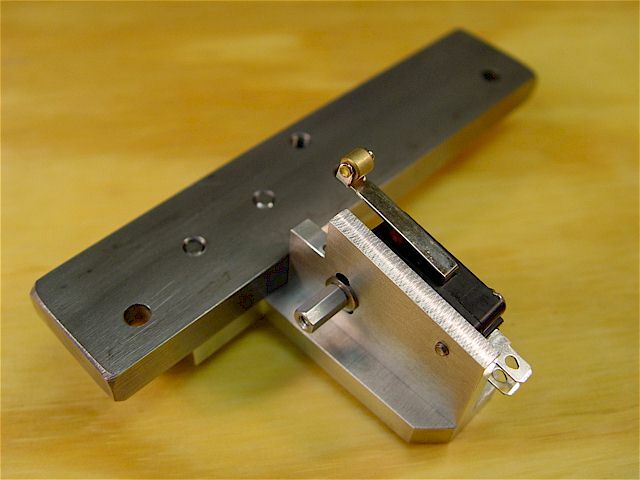 Minus X-axis switch adjustment plate. Centered underneath the table to protect from metal swarf. 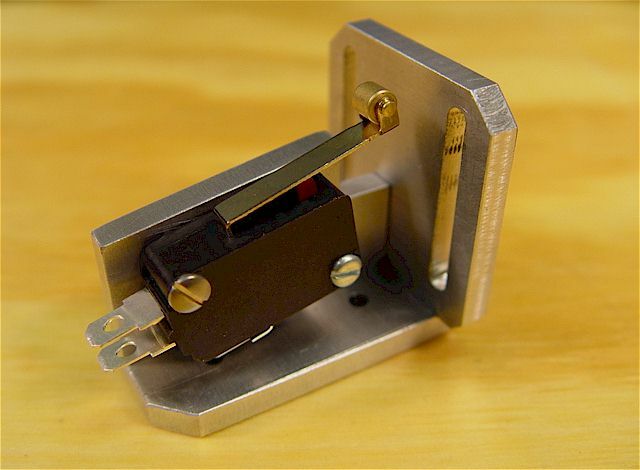 A fabricated (left) table end-plate trips the limit switch. 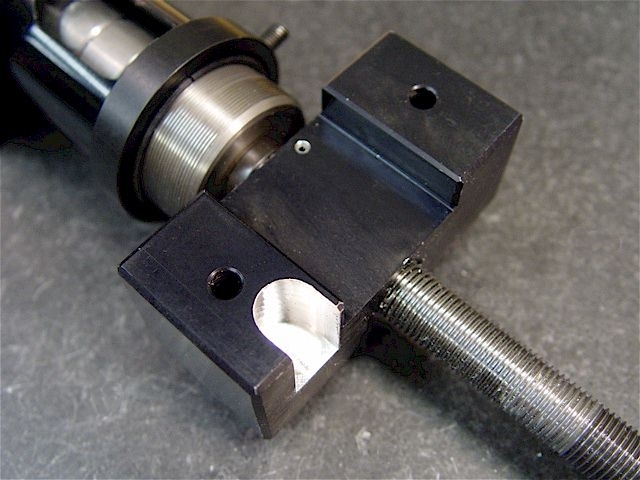 Protruding Z-axis gib adjustment screw head reduces +Z travel range. 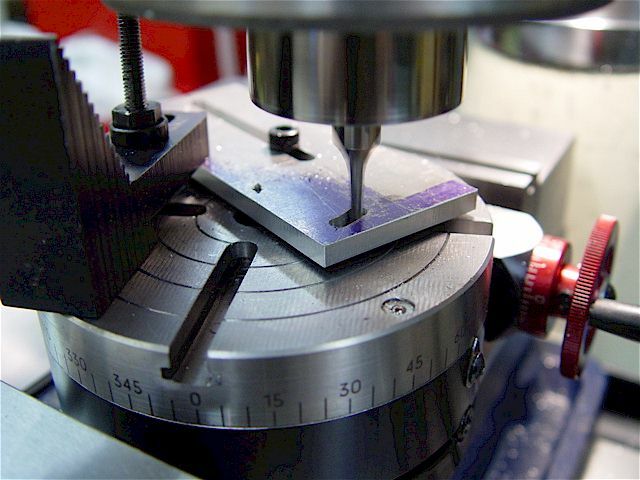 Used a 7/16" end mill to relieve an area of the bearing block to allow room for the gib adjustment-screw head. The relieved area allows an increase of +Z by 0.3" (but it can vary according to gib's extension). 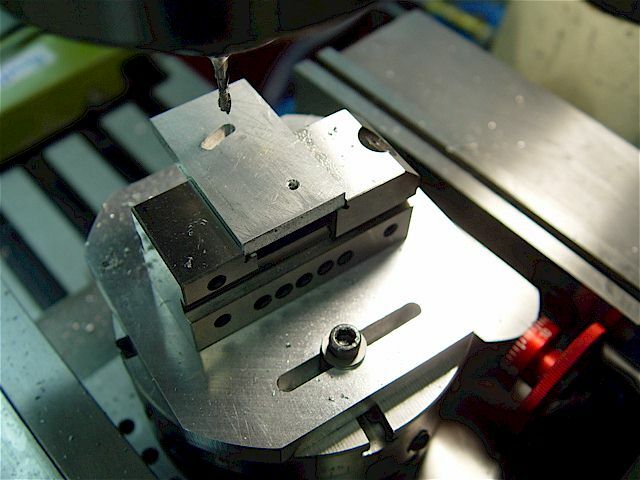 Milling the short, curved slot for the +Z limit switch plate. 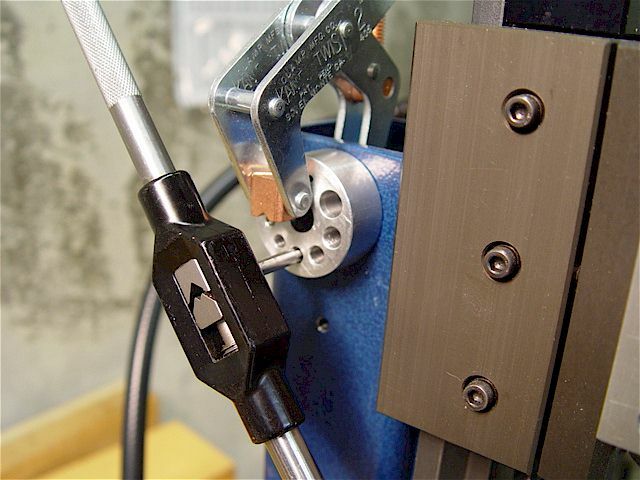 Vertical adjustment slot sized for 10-32 screws. The counter bore not really needed, here. 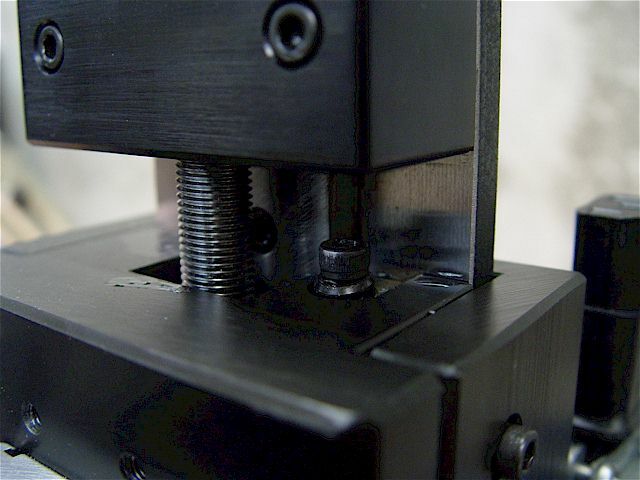 Drilled & tapped 50%, 10-32 threads to mount the +Z switch bracket & cable strain relief clamp. 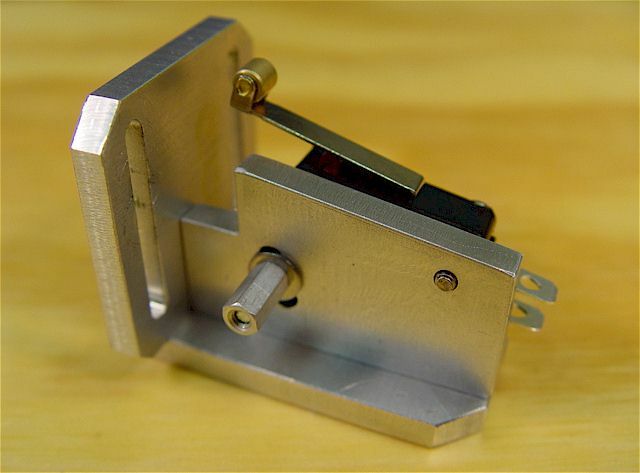 +Z limit switch trips off the top edge of the box-slide assembly. -Z limit is controlled via software. 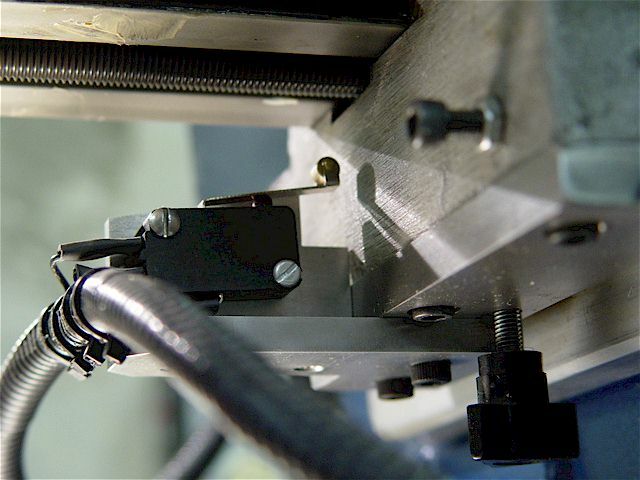 The electrically shielded limit-switch cable starts here, at the +Z. Note cable clamp for strain relief. The white Teflon-coated cable from the tachometer also runs inside the same protective sheath. From the +Z switch, the cable connects to -X limit switch & then it loops under the carriage. 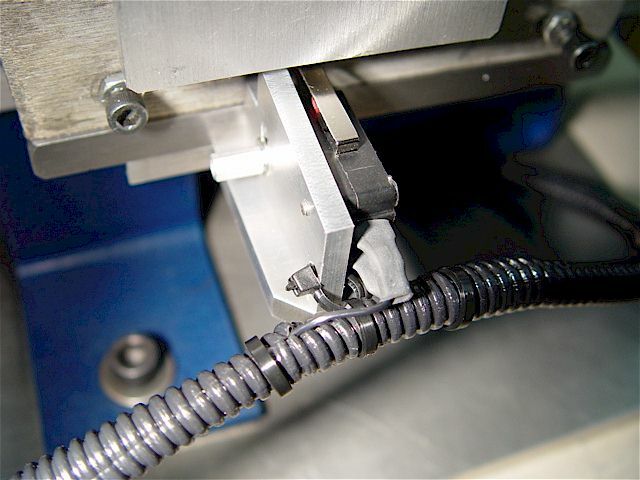 The cable is tied through a hole to the bracket for strain relief. Note the insulation on all of the switch lugs to protect against electrical short-outs due to swarf. breakout box. 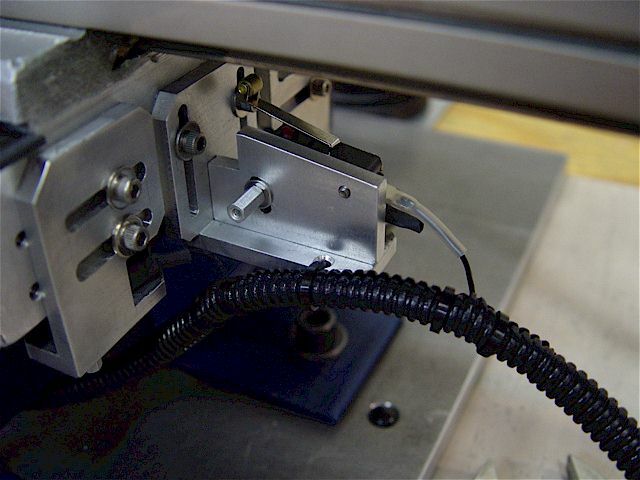 All shielding is connected to the stepper-side power supply ground. Mach3 home/limits setup: LPT1 & pin#10 is the input. I wired the shielding to the stepper-side ground of the breakout board. Under Settings Tab (Alt-6), enable (green on) the Auto LimitOverRide so you can reset the E-stop & then jog off the limit switch. In the menu under Configuration & Motor Home/SoftLimits, there are additional settings. See Mach3 Mill Manual, page 4-8. 305oz-in steppers are relatively strong & easily jam the lead screw quite tightly at the mechanical end-of-travel. The installation of the limit switches eliminated this problem plus it added a three axes homing capability. The wide range of switch adjustability afforded by the bracket design made the limit-trip setup quick & precise.